The Sun Dolphin Sun Slider 5 pedal boat comes standard with fully reclining and adjustable seat backs that allow riders of varying heights to reach the pedals. 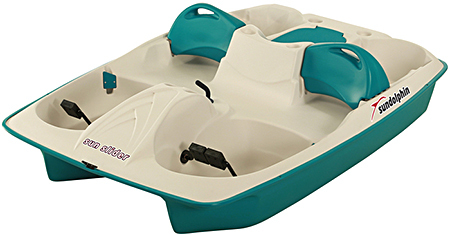 This versatile pedal boat seats 2 adults and 3 children comfortably. Spend a perfect day on the water relaxing in the Sun Dolphin Sun Slider 5!